Today's new design is inspired from a husband throwing his wife a 40th birthday party. The colors were inspired by green, teal, grey, and white party items and M&Ms. This is a new made to order design that is now available in the shop this month. I love getting custom orders and I love having so many new designs inspired by all of your requests that can be shared! I'm not sure if you can tell by the photos, but the butterfly wings pull up from the cover to give it that 3D effect. Down the center of these lovely butterflies are clear rhinestones. When you order this book, the butterflies are going to be flat against the cover, but you just have to pull up the wings to give them life since the packing and shipping make them go flat. The beauty of this design is in the elegance of those butterflies. This is a made to order guest book, so you get choice of your cover color and inside signature pages. Because Etsy only allows me two drop down options on the listing when you order, just remember to place your personalization request for the front cover of the book with the name(s) and dates in the Notes To Seller Section during check out. 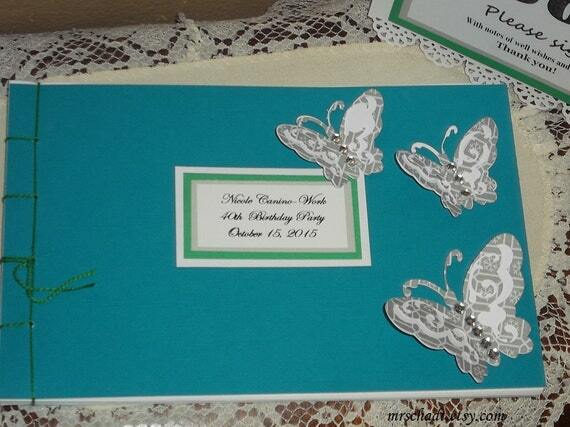 You can also drop me a note there, too if you'd like to specify your color scheme or request the butterfly colors. 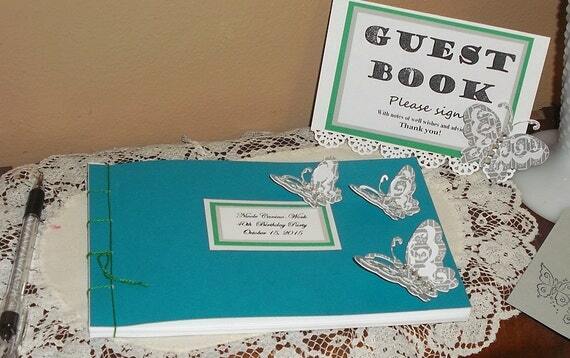 You can order the Butterfly Elegance Guest Book Design Here. I know it's getting close to Thanksgiving now, I'm working on a custom coupon book, and I can't wait to share the design with you next. The Baby Whale Guest Book has arrived.